Reference number for this case: 2-oct-54-Levroux. Thank you for including this reference number in any correspondence with me regarding this case. Two women of Cerisier, near Chateauroux, told police they had seen a "luminous bowl" about nine feet in diameter just over their rooftops. Oct. 02, 1954 Levroux (France). The author indicates that on October 2, 1954, two women of Levroux in the Indre submitted independent reports on a luminous disc of approximately 3 meters in diameter, which flew very low above the houses of the village. The two authors indicate that in Levroux in the department of Indre, on October 2, 1954 at an unknown hour, two women, Mrs Janicki and Lacotte, separately reported to the police the presence of a luminous disc estimated as of three meter in diameter, flying over the village at low altitude at the location called "Le Cerisier". The authors indicate that the sources are the Vallée catalogue, case 177; Le Figaro for October 4, 1954; France-Soir, Libération and La Croix for October 5, 1954. A disc-shaped object buzzed the rooftops of Levroux on the 2nd and was reported to the local police by two of the village women. The reports, made independently, describe the object as three meters in diameter and luminous. 15. 15. Paris, France. Le Figaro. 4 October 54. Belgian ufologist Godelieve van Overmeire notes in her catalogue that in France, in 1954, on October 2, in Levroux, in the borough of the Cerisier, two women (Mrs. Janicki and Lacotte), each one on their side reported to the police force that a luminous disc approximately 3 meters in diameter had flown over the village at very low altitude. 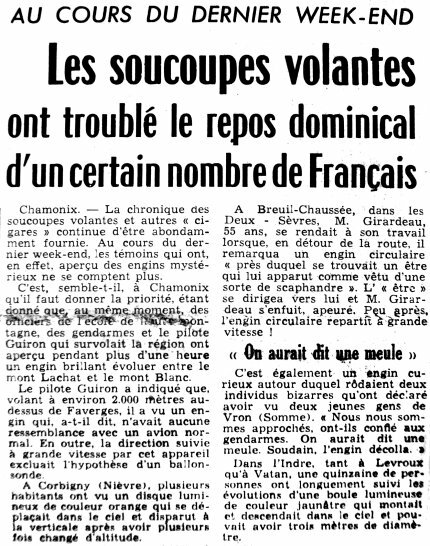 The sources are indicated as "Le Figaro, Oct. 4, 1954; France-Soir, Libération, La Croix, Oct. 5, 1954; and: Jacques Vallée: "Chronique des apparitions ET" - DENOEL 1972 - J'AI LU coll. - p. 264, 265. 1954 - In Levroux, France two single women (Janicki and Lacotte) independently reported to police that a luminous disc about three meters in diameter had flown very low over their village of Cerisier. (Sources: Jacques Vallee, Passport to Magonia, p. 215; Michel Figuet and Jean-Louis Ruchon, OVNI: Le premier dossier complet des rencontres rapprochees en France, p. 106). Jerome Beau indicates that on Saturday, October 2, 1954, in "Levroux (France), in the borough of the Cerisier, Mrs. Janicki and Lacotte announce each one on their side announced to the police force that a luminous disc approximately 3 m in diameter flew over the village at very low altitude". Jérôme Beau indicates as sources Le Figaro, October 4, 1954; France-Soir, Libération, la Croix, October 5, 1954; Vallée, J., cas n° 39, "Rapport sur l'analyse de 200 observations documentées faites en 1954". 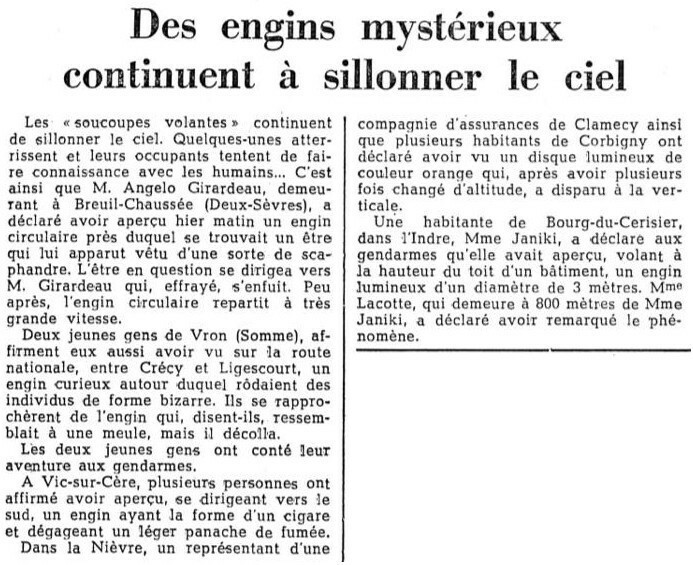 Luc Chastan indicates in his database that in the Indre in Levroux on October 2, 1954 at one unknown hour, "Two women separately reported the presence of a luminous disc estimated three meter in diameter flying over the village at low altitude at the location 'Le Cerisier'." The website indicates that on 2 October 1954 at 19:00 in Levroux, France, "A luminous disk three meters in diameter". "In Levroux, France two single women (Janicki and Lacotte) independently reported to police that a luminous disc about three meters in diameter had flown very low over their village of Cerisier." "At the Bourg du Cerisier, two women (Janiki and Lacotte) independently reported to police that a luminous disk about three meters in diameter had flown very low over the village." "An unidentified object was sighted, but with appearance and behavior that most likely would have a conventional explanation. One saucer was observed by two witnesses for 20 minutes." The sources are indicated as Michel, Aime, Flying Saucers and the Straight-Line Mystery, S. G. Phillips, New York, 1958; Vallee, Jacques, Computerized Catalog (N = 3073); Vallee, Jacques, Challenge to Science: The UFO Enigma, Henry Regnery, Chicago, 1966; Vallee, Jacques, Preliminary Catalog (N = 500), (in JVallee01); Vallee, Jacques, Preliminary Catalog (N = 500), (in JVallee01); Hatch, Larry, *U* computer database, Author, Redwood City, 2002. *Oct. 2, 1954 -In Levroux, France two single women (Janicki and Lacotte) independently reported to police that a luminous disc about three meters in diameter had flown very low over their village of Cerisier. (Sources: Jacques Vallee, Passport to Magonia, p. 215; Michel Figuet & Jean-Louis Ruchon, OVNI: Le premier dossier complet des rencontres rapprochees en France, p. 106). [jv2] Summary by Jacques Vallée in "En Quête des Humanoïdes", book by Charles Bowen, French translation of "The Humanoids", J'ai Lu publisher, France, page 40, 1974. [fr1] "OVNI, Premier Dossier Complet des Rencontres Rapprochées en France", book by Michel Figuet and Jean Louis Ruchon, Alain Lefeuvre publisher, France, page 106, 1979. 1.0 Patrick Gross February 27, 2009 Conversion from HTML to XHTML Strict. First formal version. Additions [go1], [jb1], [lc1], [ud1]. 1.1 Patrick Gross July 29, 2010 Addition [le1]. 1.2 Patrick Gross October 2, 2014 Addition [ni1]. 1.4 Patrick Gross December 12, 2016 Additions [lg1], [ub1]. 1.6 Patrick Gross January 11, 2017 Addition [nr2].